Sir William Osler is reputed to have said, “Listen to the patient and he will give you the answer.” Had he been alive now and practicing transplantation for lymphoma, he could have well said “Read the Clinical Guide to Transplantation in Lymphoma and it will give you the answer.” These reviewers are very impressed by the breadth and scope of this book edited by Drs. Bipin Savani and Mohamed Mohty, ably aided by an array of expert contributors from all over the world. exponential information growth this book is surprisingly current, with the latest references. It has an ambitious scope, setting out to cover all aspects of transplantation in lymphoma and managing to meet that expectation. and allogeneic transplant, and a novel chapter, “First 100 Days of the Autologous Hematopoietic Stem Cell Transplantation Process in Lymphoma.” The chapters in section 1 are broadly applicable and would prove invaluable to trainees pursuing fellowships in hematopoietic cell transplantation. Section 2 is laid out as a chapter by chapter discussion of various lymphoma histologies and the applicability of hematopoietic cell transplantation in each. One can return to some of these chapters again and again because all common and most rare lymphoma subtypes (including HIV-associated lymphoma) are discussed in excellent detail. We found each one of these chapters to be remarkably up to date. In a field such ashematopoietic cell transplantation,where there is considerable ambiguity and few randomized studies, the authors and editors have maintained a neutral and unbiased tone,discussing the available data andguidelines exhaustively. Very few similar textbooks focus on transplantation in a disease group. 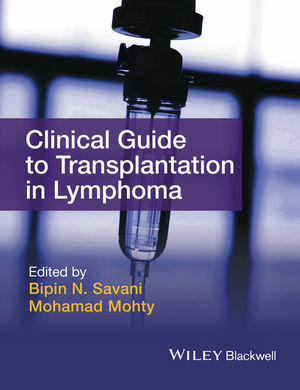 Clinical Guide to Transplantation in Lymphoma is concise enough, practical, and clinically oriented to be considered a practical manual but at the same time manages to be comprehensive. Some unique features in this book are the numerous excellent graphs and tables and the discussion of case studies and clinical guidelines (United States and European) wherever applicable. We found very few typographic errors. For future editions we recommend at least 1 chapter devoted to the emerging field of cellular immunotherapy.